The progress of the Central Alberta section of a cross-Canada trail has taken several steps forward with a promise of money for a pedestrian bridge across the Blindman River. "Alberta TrailNet has pre-approved $100,000, as soon as we get the engineering done," said Debbie Olsen, president of the Central Alberta Regional Trails Society. Because the engineering hasn't been done yet, there is no estimate of the ultimate cost. Engineering for a bridge to carry the trail across the Battle River north of Ponoka is complete and a figure of $500,000 has been mentioned. Olsen said there is hope that number can be reduced and that a more economical bridge can also be built over the Blindman, possibly using a Bailey bridge. A Bailey bridge uses a system of prefabricated steel trusses to create spans that can be built quickly. They are used in many places but are commonly used in military situations. Olsen said such possibilities as providing the material and getting Canadian Forces to build the bridges may be examined. That has been done on the trail in other parts of the country. "If we can (use Bailey bridges), our grants would go a long way towards building the bridges. In the meantime, various sources of funding are being examined or sought. In other areas, Olsen is hopeful a section of trail between Springbrook and Penhold is closer to reality. One km of trail is to be built in Springbrook in the spring, said Paul Pettypiece. Pettypiece is vice-president of the Central Alberta Regional Trails Society and president of the Springbrook Community Association. "It's a start," said Pettypiece, who has been working to get the trail built between Penhold and Red Deer for eight years. "We're fairly anxious to get the thing done," said Pettypiece. It had been hoped that the trail would run beside Hwy 2A but Red Deer County preferred a route alongside RR 281, about 1 km west of the highway. It would require permission from landowners. The county had planned to have meetings with landowners and stakeholders by Sept. 30, said Pettypiece. The consultation process is now scheduled for February, said Jo-Ann Symington, community services manager for the county. She said the county is in the process of developing implementation strategy for the trail between Red Deer and Springbrook. A $1.2 million investment from the Alberta government will support efforts towards completing the province's 2,200-kilometre portion of the Trans Canada Trail. "The Trans Canada Trail is a key component of our provincial trail network," said Hector Goudreau, Minister of Tourism, Parks, Recreation and Culture. "It draws important tourism dollars to communities across Alberta, and gives Albertans a great way to stay active while enjoying our province's natural beauty." The Alberta TrailNet Society will administer the grant, which is provided through the Alberta Lottery Fund. This funding will be used for trail planning, design and construction as TrailNet continues to work with local stakeholders to expand on the 60 per cent of the Alberta portion already open. As Alberta's provincial trail council, TrailNet is responsible for promoting development and responsible use of the provincial trail network in the interests of a broad range of user groups. It also implements the Alberta portion of the Trans Canada Trail. "This new funding provides critical support to our local and community partners who are working hard to build the Trans Canada Trail," said Peter Barr, president of Alberta TrailNet Society. "It will enhance the efforts of dedicated volunteers, as well as help fully maximize donor contributions to make the Trans Canada Trail through our province a reality." Alberta is a hub for the Trans Canada Trail with the east-west land route, the north-south Arctic land route, and the Arctic water route meeting in Alberta. The 2,200 kilometres of trail showcases local sites of interest and the diversity of recreational, historic, natural and cultural opportunities across the province. 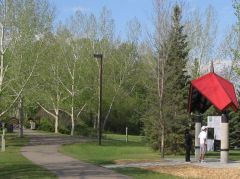 More information on the Alberta portion of the Trans Canada Trail is available at www.albertatrailnet.com. TrailNet and its national, provincial and territorial partners hope to complete the Trans Canada Trail by 2010. Once complete, the trail will be an 18,000-kilometre recreational corridor that winds its way through every province and territory, linking over 800 communities along its route - the longest trail of its kind in the world. 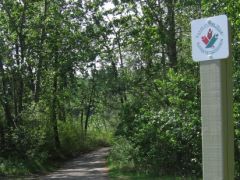 More information on the Trans Canada Trail is available at www.tctrail.ca. Supporting Alberta's trail network is part of Premier Ed Stelmach's plan to improve Albertans' quality of life. Other priorities for the government are to govern with integrity and transparency, build a stronger Alberta, manage growth pressures and provide safe and secure communities. Red Deer County council has approved construction of three trails, kick-starting a major effort to boost recreational opportunities. A 3.6-km trail will be built from Springbrook to Penhold, a 6.8-km trail will be built between Spruce View and Dickson and a one-km trail will be constructed at the west end of Glennifer Lake to provide public access to the Red Deer River. The University of Calgary's Urban Lab has been contracted to prepare project plans for the trails and consult with area landowners. The trail project plan is expected to cost $10,000. The county has $90,000 earmarked for trail development in its budget this year. "I'm glad we're finally doing something," said Councillor Penny Archibald. "It's long overdue." The county's existing trails are well used and will get busier as people seek to take better care of themselves, she said. The county's effort to increase its network of trails will not come cheap, said Councillor Jim Lougheed. "But I think it is well worthwhile." Trail development is not supported by all landowners, but the county's proposed projects show routes can be found that fit in with community expectations. "I'm encouraged by this. I look forward to seeing this," Lougheed said. Archibald also wants to see a trail considered for Township Road 362, which approaches Pine Lake from the west. The county redid that road a couple of years ago but did not put a trail in at the time. It is common to see people walking along that road, which also sees a lot of fast-moving vehicles, she said. Councillor Jim Wood agreed that the road needed a trail. "Every time you drive down the road, there are people walking on it." The trails will be well used, he predicted. Trans Canada Trail organizers are looking at bridging two rivers to accommodate hiking and biking trails between Red Deer and Ponoka. "Rivers are major trail blockers. You can't build trails without building bridges," said Derry Armstrong, trail co-ordinator with the Trans Canada Trail Foundation. His foundation is scoping out locations for two pedestrian spans -- over the Blindman River near Blackfalds and the Battle River north of Ponoka. Armstrong said the preliminary design work hasn't been completed for either bridge, but the Town of Ponoka supports the one project. The Ponoka pedestrian bridge is estimated to cost $250,000. It is expected to need funding from the government, private sources and fundraising. Armstrong believes the Blackfalds area bridge will cost even more, since it needs to be longer to span the Blindman River. The group is approaching the counties of Lacombe and Red Deer to seek permission to build this bridge. "There's a lengthy approval process," said Armstrong, who believes it will take a minimum of two years before construction begins. Fisheries and Oceans Canada rules must also be followed to cause the least disruption to aquatic species. Once the bridges are built, hikers can use quiet country roads to get from Red Deer to Ponoka, but Armstrong's group eventually plans to build offroad trails for hikers and cyclists linking Penhold, Springbrook, Red Deer, Blackfalds, Lacombe and Ponoka. In the larger picture, Armstrong envisions trails between Calgary and Edmonton. The goal on a national level is to have trails right across the country. "The idea is you can get onto a trail in Lacombe and hike all the way to St. John's, Nfld.," said Armstrong. Compared to other Canadian provinces, Alberta is behind on creating public trails, said Armstrong. This is partly because fewer railway right-of-ways exist and also because many rural Albertans were initially distrustful of having trails along their property, Armstrong added. "There was some rural backlash, but I think that's changing. People aren't as threatened by trails."